Would You Like to Be Assured That Your Images Are The MOST Memorable In The Minds of Others? 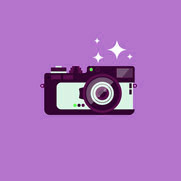 This is a fact– There are approximately 3.8 “Billion” users on the Internet, and they upload an average of 658 “Billion” photographs per year. And that doesn’t even include the mobile phone crowd! What I am about to share with you is the “Single Most Important Lesson” that you can learn regarding your photography. Storytelling is the single biggest photographic skill, that you can learn, that will make your work stand out from everyone else. How will storytelling make your work stand out? 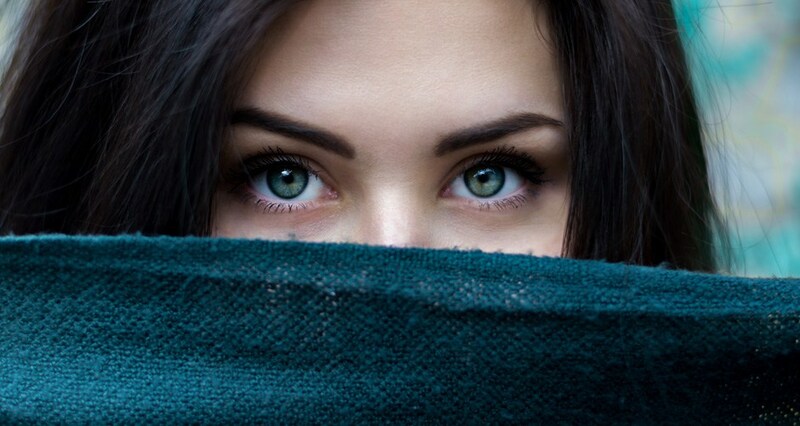 No one else has lived your life experience, and that creates your unique impression of everything around you. 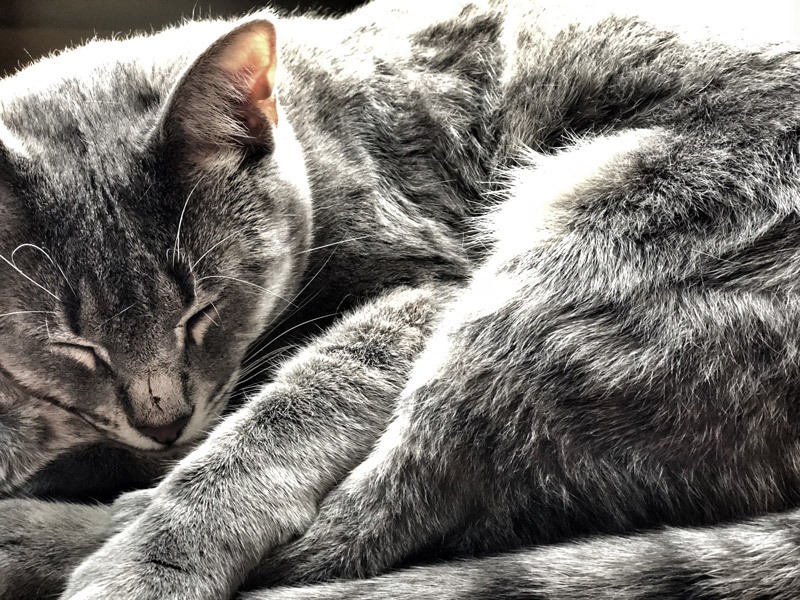 Do you know why storytelling will make your photographs better? Storytelling touches on all of the memory retention buttons within the human brain. A good story communicates a message that sticks in your brain. And you are going to learn how to make your images stick in others' brains like glue. Even a slight change could turn that image from something “normal” and “not memorable” into an image that is an unforgettable storytelling effort. ...Something truly special, that has a lasting impact on the viewer. Would you like your photographs to do that? Then keep reading and we'll show you how.. 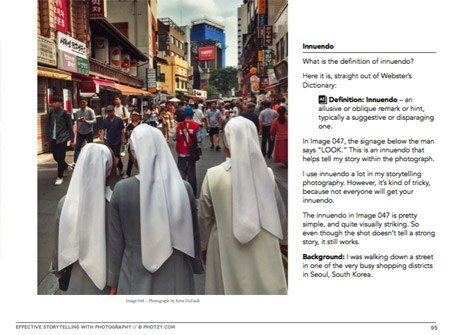 Introducing 'Effective Storytelling With Photography' By Kent DuFault. 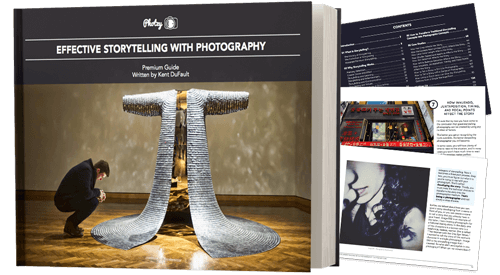 This premium guide is 133-pages of deep training, giving you a simple and practical understanding of using storytelling to make your photographs stand out. You'll get 7 complete chapters of training, illustrations, case-studies and self-check quizzes. It will teach you every aspect of the storytelling process, and also, (even more importantly), how you can implement that knowledge into your photographic efforts! Think about how that would feel, possessing the skill to impart your personal stories out to the world. This is why this training is SO important to your photography. Telling your story, with your image, is the ONE THING that can set you apart from every other photographer on the planet! Let’s face it. If you have no idea what ‘story structure’ is… How could you possibly understand how to apply it to a photographic situation? ...and this skill will turn your photos into something ‘valuable’ that is uniquely yours. 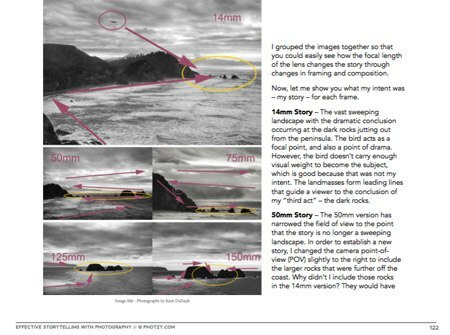 The honest, no ‘bull crap’, truth about why composition on its own cannot create a storytelling photograph. 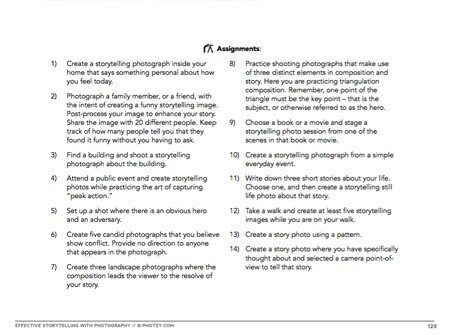 Clear and straightforward advice on how to tell a story with ANY genre of photography! How your images will live and die based upon their validity. Why SO many photographers can’t create a storytelling shot, because they don’t understand what exactly makes up a story! You will NEVER again waste an opportunity by shooting a ‘meaningless’ photograph! The Truth behind what ‘storytelling’ IS NOT. 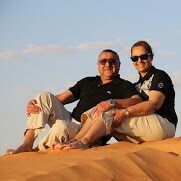 Discover the Pure Magic- when viewers of your photography- fully understand what you intended to say to them! Don’t settle for a meaningless comment like, “Nice Shot”. Learn to hit your viewer’s emotional buttons hard and fast. Page 20 – Discover how to tell a strong story, from any event. Page 36 – Learn why some storytelling attempts fall flat on their face- So that you don’t make the same mistakes. 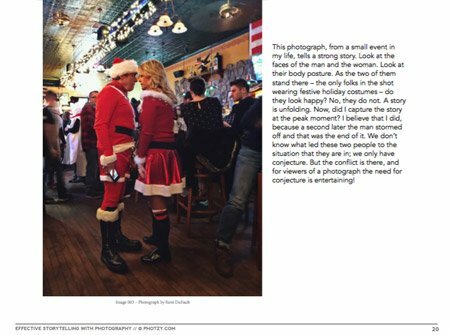 Page 46 – Learn how to shoot storytelling shots that no other photographer is taking… even if there are dozens of photographers standing all around you. Page 83 – Learn how to analyze a scene quickly to tell the “best story”. 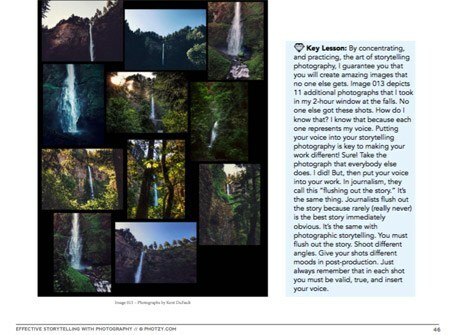 Page 95 – Discover how the storytelling tools used by authors- in their written works- can also work for you as a photographer! 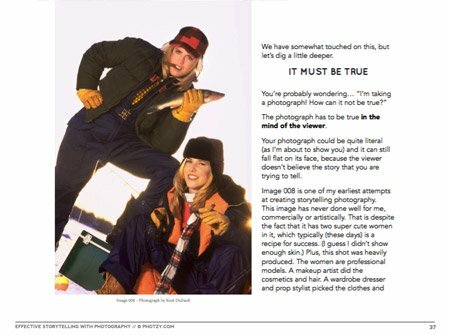 Page 122 – Discover how simple changes with your equipment can vastly change the storytelling message that you will send out to your viewers. This includes the comprehensive Premium Guide, 14 Training Assignments, a detailed 35-question Quiz, the THREE free bonuses, plus there are several exquisitely detailed case studies inside the guide- These case studies will help firm up the storytelling concepts in your mind. There is ABSOLUTELY no other guide, or book, out there like this! Don’t hesitate if you love the idea of telling “Memorable Stories” with your photography! Remember – With this guide, you're getting a comprehensive tool for learning how to add meaning and impact to your photography. And, it's at a fraction of the cost of an in-person workshop. Plus you can re-read the material for FREE anytime you want, whenever you need a quick refresh. Don’t let your lack of knowledge cripple your ability to produce meaningful photography! Click Add-to-Cart now to get your copy of Effective Storytelling + get the printable checklist & 2 videos, for FREE! 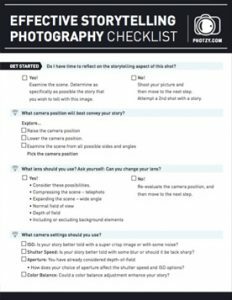 A handy checklist for remembering all of the key elements of storytelling with your photography! Print it out and and pop into your camera bag for a quick reference whenever you need it! Using a High Pass Filter & Localised Sharpening. 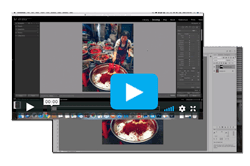 Both these videos will help you improve the storytelling elements in your photographs with post-processing! 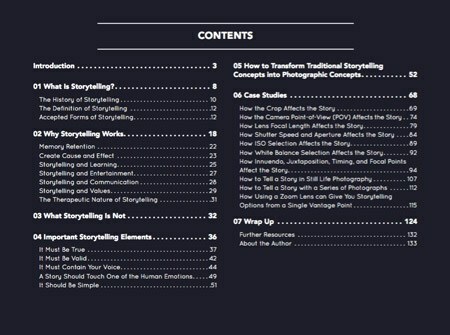 Get “The Effective Storytelling Guide” the “Printable Storytelling Checklist” and the “Two Video Tutorials”- for less than the cost of a meal for two. 'Battle scar', the photograph above, is a simple shot… where the story could have easily been lost. 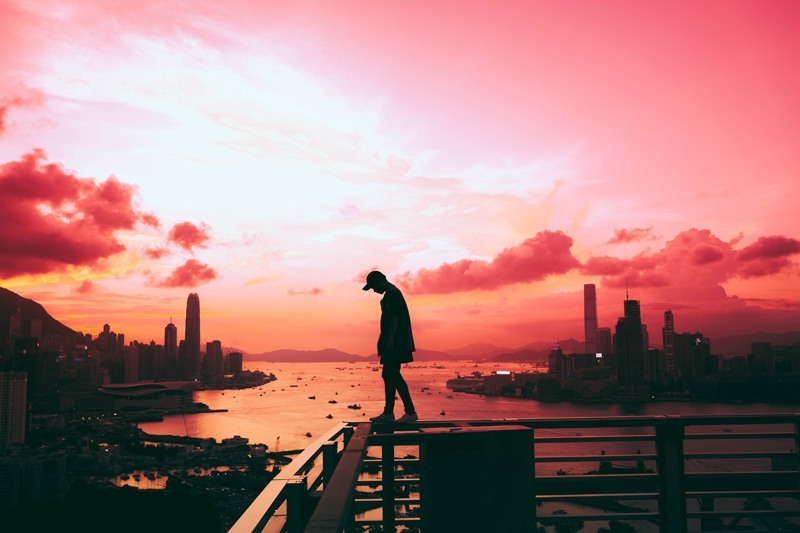 You and I both know that in order to become a great photographic storyteller- it takes more than having a few composition tips in your pocket. In order to become a great storyteller- you need to understand the building blocks of… what makes a great story. 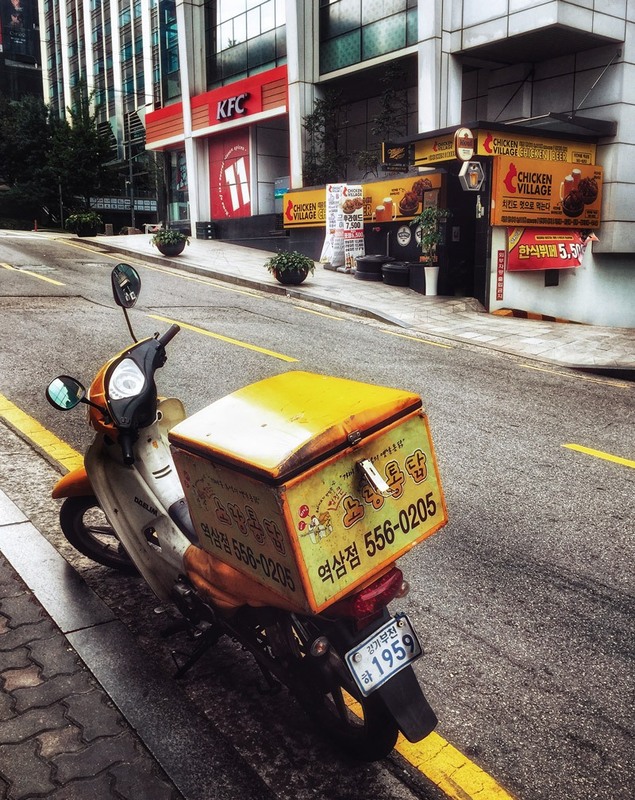 This photograph is titled, “The Saga of Chicken Village”, is based upon a story arc that dates back thousands of years. Moments like this… will suddenly appear everywhere you look! It’s because you now know what to look for! You’ll learn the secrets behind- How to communicate a story idea- VISUALLY! 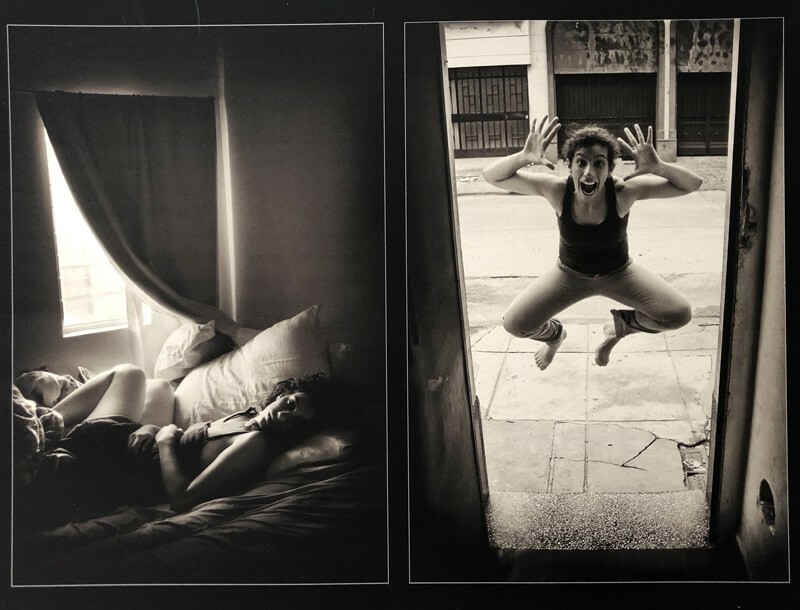 Become an expert at telling stories with multiple photographs- this is the core skill of a photojournalist. Discover how to tell multiple stories from a single vantage point. 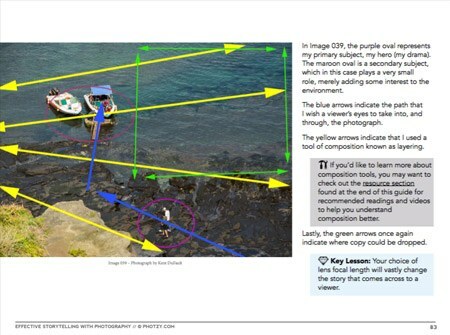 Transform your photography - through a thorough discussion – (of a Hugely Important Storytelling Tool) - The Crop. Everyone talks about storytelling photography- But… very few KNOW what actually ‘creates’ a story in a photo! You will be one of the few! 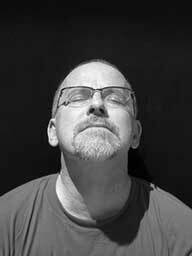 "Those of you who have followed my writing and photography know that I’m a huge proponent of storytelling in photographic imaging. For those of you that are new to my writing, in my mind a professional-level photograph consists of three components: technically sound (although a quality photo doesn’t always have to be technically perfect); an organized composition (without that your photograph is a lazy mess, and a viewer feels that... even subconsciously); and most importantly, the photograph must convey a message to the viewer, which is ‘the story’. Storytelling photography takes effort. I won’t lie to you. The good news is- You CAN learn this skill! The more you practice what you will learn, the better you will become at it. Eventually, it will become second nature- like riding a bicycle… You’ll be shooting storytelling photos without even realizing that you’re doing it! With this guide, I’m going to get you there." There are current events that are shaping our lives right now. And then, there are the future moments we haven’t yet lived. With this guide you will be a Master Photographic Storyteller! OPTION#2 Take control of your photography now. Grab this proven guide. And let a world-class teacher give you the knowledge you need, to produce truly unforgettable & meaningful images, every time! 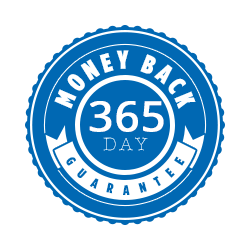 It's only $50 $29 for a limited time, and it comes with an unbeatable 365-day, money-back guarantee.